The Union Budget 2018 has been announced and while there’s good news for tech companies manufacturing in India, things are not so rosy for those who rely largely on imports. The government has now made it more expensive to import TV panels, smartphones, printed circuit boards (PCBs), camera modules, connectors, cars and motorcycles, smart watches/wearable devices, video game consoles, and other PC components. This will in turn affect the prices of a plethora of devices. Let’s take a look at all the affected devices and what to expect from your 2018 gadget purchases. The custom duty on imported handsets has once again been raised from 15% to 20% in order to boost the government's Make In India initiative. This will push foreign smartphone manufacturers to invest more in producing their smartphones in the country but increase the prices of all imported mobile phones. Analysts have predicted that companies like Apple, Xiaomi, Google, Motorola, and others who import their devices and components into the country will be among the most affected by the customs hike. The government has also doubled the import duty on LCD, LED and OLED panels from 7.5% to 15%. The administration feels this will help boost local manufacturing of these panels. However, consumers will have to shell out more for TVs from manufacturers like Sony, LG, Samsung and many others. So overall, as importing the LCD, LED and OLED panels gets costlier, it will add to the expense consumers will have to bear while buying Televisions, monitors and any gadget which features the aforementioned display panel technologies. Printed Circuit Boards or PCBs are used in nearly every gadget one can think of. As the import duty on the PCBs increase, so will the prices of smartphones, PC motherboards, CCTV’s, mobile phone chargers, inverters, LED lights and many more products. Most of the small scale and large scale devices requiring PCB’s are imported from other countries and this is essentially a push for local manufacturing of components of these products. Camera modules comprise of an image sensor integrated with a lens, control electronics, and an interface. It is obviously used in smartphones, tablets, CCTV cameras and virtually every gadget that features a camera setup. 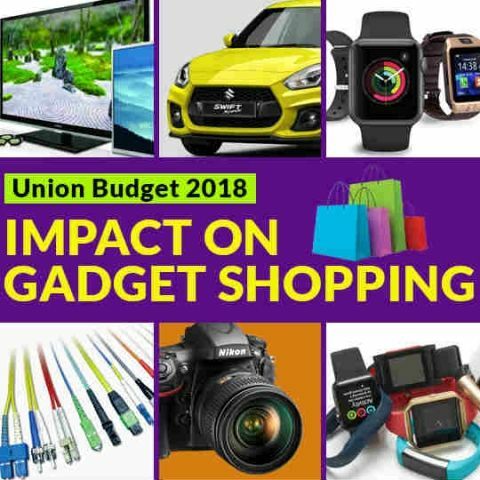 All of the above mentioned gadgets will now get a slight price bump as the cost of these camera modules increase and different connectors for PCB and other electronic components will also observe a price hike, which will be incurred by customers. As per the new Union Budget, most of the imported luxury cars and bikes, along with those which are built using imported parts, may soon receive a price hike. Customs duty on all vehicles imported as Completely Built Up (CBU) units has been increased from 20 to 25 percent, whereas the same has been increased for Completely Knocked Down (CKD) kits units to 15 percent, up from 10 percent. So, buyers who are interested in owning vehicles imported in India by companies like BMW, Harley-Davidson, Mercedes, Ducati, or any other such brands will now have to pay a little extra than before. As the import duty fees on display panels, PCB’s and overall imported products increases, smartwatches and other wearable devices like fitness trackers will also increase. Samsung, Motorola, Huawei, LG and other smartwatches will now cost more as the components price increase. Microsoft recently launched its Xbox One X in India but with the hike in imported products, one expects its price to go up. Not only the Xbox One X, Sony’s PS4 can also be priced higher than it’s currently priced at. However, the aforementioned companies are more likely to incur losses instead of making their customers pay more. The import hike will most certainly affect the next gaming consoles which will be launched in the country. The Xbox One X is already priced Rs 10,000 higher than its US variant. Various PC components ranging from motherboards to Graphic cards will now be more expensive to purchase. RAM, HDDs, SSDs and cabinets will also cost higher than before. There are some local cabinet manufacturers in India, however, most PC components are imported into the country. Graphic cards are already touching exorbitant prices due to heavy demand in cryptocurrency mining and one can expect the hiked import duty to add to it.